McGill University/Mookai Design Co, Plasma Postproduction, and Tom Beghin. Joseph Haydn lovers in Britain are very well served by recordings, some of them involving latest technologies. 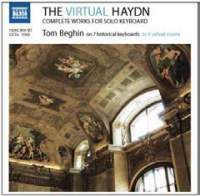 The newest to have come our way is Tom Beghin's totally amazing The Virtual Haydn, completed for the Haydn bicentenary in 2009, its original 2009 USA release then in Blu-ray [above]. It has now been re-released in GB by Naxos (2011) in a modestly produced boxed set of 13 discs, 12 normal CDs + one DVD in paper sleeves [below R]. For the last fornight we have been playing them all again and again, and in both formats, marvelling at the reconstructed original period instruments and Beghin's inspired playing. The documentary DVD gives a full account of this pioneering project to record the mammoth oeuvre as if the performances on newly constructed instruments were in authentic settings where the originals would have been played in Haydn's own time; it is all so very innovative that a book Virtualising Haydn is in preparation. Sales were excellent in the circumstances, but ownership of Blu-ray players * still remains restricted on both sides of the Atlantic (we use ours for reviewing opera and dance DVDs). Whilst the new UK version [R] is fine for collectors who don't have blu-ray capability, the other is superior in packaging and convenience (all 18 hours on 4 discs), and the sound too is importantly superior. The most useful review I've found of the original 4-disc USA release (by a non-Haydn specialist) is Brendan DuHamel's of December 2009 in BluRayDefinition.com. You will find too a disconcerting range of opinions at Amazon.com, the most dismissive "Haydn's music can be performed on the pianoforte nowadays, a rather remarkable instrument with a reputable range - not a series of unattractive, historical instruments conjured up from long, long ago" !! There is a huge divide about pianos for 18th C music. For many years now we have espoused the fortepianos which have an ever increasing availability and profile at the highest level, most recently in Mozart performances and recordings by Bilson, Sonfronitsky, Bezuidenhout & their ilk, and I am beginning to find it harder to enjoy this music on a Steinway. 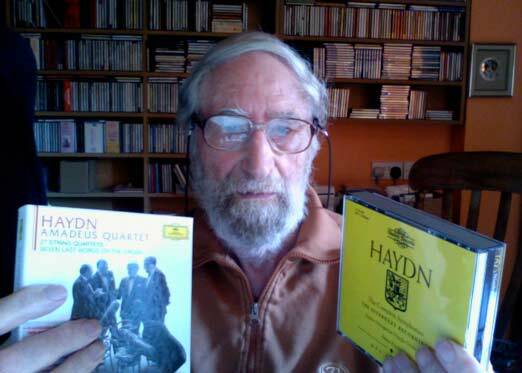 But others, including the distinguished pianist/composer who was the first to record the Haydn sonatas complete, are firmly set against the HIP and original instruments movements: "Tom Beghin's performance of the Haydn Variations is not one I enjoy, for various reasons - - it would be a waste sending me any CDs". My links will however lead you to many ecstatic positive reviews, to which mine is added. I am not here going into questions of performance, save to say that Tom Beghin is as gifted an interpreter of this corpus of keyboard music as you'd be likely to find anywhere; he is technically impeccable, totally to be trusted and, beyond that, many of his performances sound more spontaneous than academic, and are both beautiful to hear and viscerally exciting. This is not a set for experts only, and within the 18 hours listening and learning everyone will discover marvellous music which they didn't know. So, to show my hand clearly, I treasure this set as, unquestionably, our Recording of The Year and indeed one of the most remarkable combined achievements I've encountered during 60 years of intensive listening. It is a shared achievement by musician/musicologist Tom Beghin with the extended Virtual Haydn team of two leading creative engineers, Martha de Francisco (producer) and Wieslaw Woszczyk (engineer), working closely with leading international makers of early keyboard instruments, who made and tended through the project copies of important instruments of Haydn's time. All these are credited and more in the thick illustrated booklet, which is packed with information about all the music, and about virtual acoustics and the progress of this project. A great deal is explained and illustrated also in the DVD, which accompanies both the three "pure sound Blu-ray CDs" or the alternative 11 normal CDs in Naxos 8501203, and comprises an absorbing documentary, followed by several full performances of sonatas in which it is wonderful to watch Beghin playing in various suitable "virtual" locations and responding to their acoustics - so different from the more usual recoding in a dry studio and "adding reverb" afterwards. Enough words; treat yourselves on YouTube now to seven introductory minutes explaining "Playing the Room", with Beghin, de Francisco and Woszczyk, also featuring early piano maker extraordinaire Chris Maene. There are minor navigation problems in the Blu-ray version which are not explained in the booklet - could usefully be clarified on the Virtual Haydn website? Complete Symphonies, Violin Concertos in C & G, Overtures La Vera Costanza, La Fedelta Premiata, March for the Royal Society. Essays by Adam Fischer in the insert booklet explain his use of modern instruments; others on The Symphonies of Joseph Haydn & The Story of the Nimbus Haydn Cycle are available on a .pdf file, which can be viewed at any desired size. Twenty years on, these "modern-historic" recordings have been re-released by Nimbus in a new packaging which suits them perfectly for convenience and price. This is an innovative approach, by way of something of an experiment prompted by the anniversary year, one which Nimbus is not aware of its having been done before, certainly not so in the classical world, says project director Adrian Farmer. For MP3 CDs they chose a high bite-rate compression that produces the highest quality allowed within the MP3 rules. To most ears (including mine) it is indistinguishable from a normal CD. I found that they played easily on DVD players; with our portable Sony, which has excellent sound, all you have to do is pop the disc in the slot and wait for the magic to happen. We sampled the project by listening to Symphonies 17 & 18 (neither of which I knew, I must confess) - delightful ! On my iMac you do the same, then click on the CD icon which appears on the desktop and select the clearly labelled track you want to listen to. I expect a lot of us will also listen to them on our iPods... The discs don't play on standard CD players, but that shouldn't prove a problem. Haydn String Quartets: Op. 51 'Seven Last Words' String Quartet, Op. 54 Nos. 1 - 3, Op. 55 Nos. 1 - 3, Op. 64 Nos. 1-6, Op. 71 Nos. 1 - 3, Op. 74 Nos. 1 - 3, Op. 76 Nos. 1-6, Op. 77 Nos. 1 & 2, Op. 103. Following the release for about £25 of all 104 Haydn symphonies on 8 CDs in the Nimbus MP3 edition, the Amadeus Quartet's Deutsches Grammophon recordings of 27 later string quartets have reappeared in slip-cases, conveniently boxed and available for <£45. Some of our readers are sceptical of claims that Nimbus' mp3 recordings, at "the highest allowable bite-rate compression" are indistinguishable from normal CDs. Here is an opportunity to compare and contrast. Older collectors will be familiar with at least some of these well loved Amadeus recordings. They are supplied with notes by Tully Potter, who reminds us of the history of this pre-eminent group who stayed together for 40 years, disbanding upon the death of violist Peter Schidlof. Only cellist Martin Lovett still survives, and he continues to play Haydn - and only Haydn - in trio and quartet with young friends. Potter says of these performances that their style is so homogeneous that it helps to follow their recordings with a score. There is a satisfying "rightness" in the Amadeus' unaffected interpretations and small blemishes from leader Norbert Bainin's violin can be taken in our stride, even though his sheer technical virtuosity is not quite up with some of today's most high-powered groups. To celebrate the Haydn tricentenary in style, you'll need both of these boxed sets.